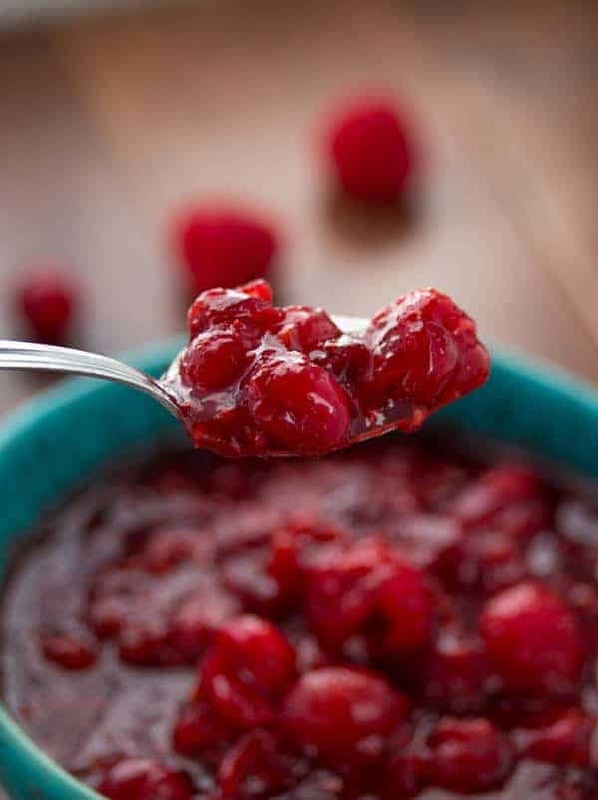 This raspberry balsamic cranberry sauce is an easy and delicious twist for your Thanksgiving feast. I know, raspberry balsamic cranberry sauce…in September? Here’s the deal: Canadian Thanksgiving is October 13, which is about three weeks away. In that time, I am going back to work, throwing Kai’s first birthday party, and hosting Thanksgiving. So, I thought I would get the Thanksgiving recipes rolling a little sooner than normal! And if you’re American, I am reeeally early. Bookmark this one for November, it’s a keeper! And about the turkey: I won’t even bother unless there is cranberry sauce involved. A big scoop of that sweet, tart, gooey sauce. I like my cranberry sauce with a little bit of turkey, please! OK, stepping down from my crazy lady cranberry sauce rant. I wanted to make my own cranberry sauce recipe, something a little different. But not too different, I didn’t want to mess with a good thing. I almost went chipotle on it, but I have done a lot of chipotle recipes this summer. Instead I went raspberry on it. Then a little balsamic on it. Both good decisions. This raspberry balsamic cranberry sauce is definitely not the same as the original, but still has the tart, sweet flavors that I love so much. There is a fresh raspberry twang to it, and a teeny little balsamic zing at the end. Twang and zing…am I making up words here? One Three more things: 1} it still only takes about 10 minutes to make, and 2} it is much prettier than those can-shapped wobbly things, and 3} your taste buds will think they’ve died and gone to heaven. And I’m done. More Thanksgiving recipes for us! In a medium saucepan, combine the water and sugar, and bring to a boil, stirring until all sugar is dissolved. This cranberry sauce sounds amazing!!! Thanks Marla! And thanks for linking it! OMG how have I never made cranberry sauce before? This looks totally yummy! I’m definitely gonna try to make it this Thanksgiving, no more canned cranberry sauce for me! Yay! Hi Trang! 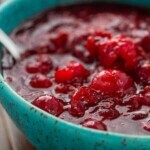 YOu should totally try making your own cranberry sauce, it is SO easy! 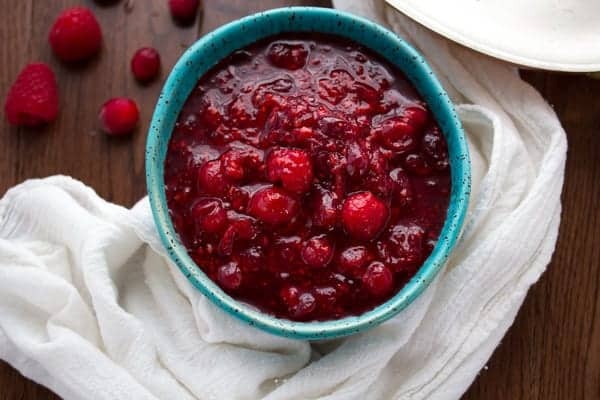 omg so much better than a regular cranberry sauce! saving this for thanksgiving!! It’s never too early to start with gathering Thanksgiving recipes and ideas. I can’t wait to make this sauce. It looks spectacular Denise. You must be feeling sort of anxious about everything that’s coming your way and going back to work. Absolutely bookmarking this one! I bet that touch of vinegar and raspberries makes this spectacular! Great pics! Your pictures make me want to eat this sauce with a spoon. Simply gorgeous, Denise! And I totally agree – making your own is so simple and tastes sooo much better than the stuff from a can. Definitely bookmarking this one! I’m glad you are on board with the homemade stuff, Kathi! So much better! I would want to eat this by the spoonful! 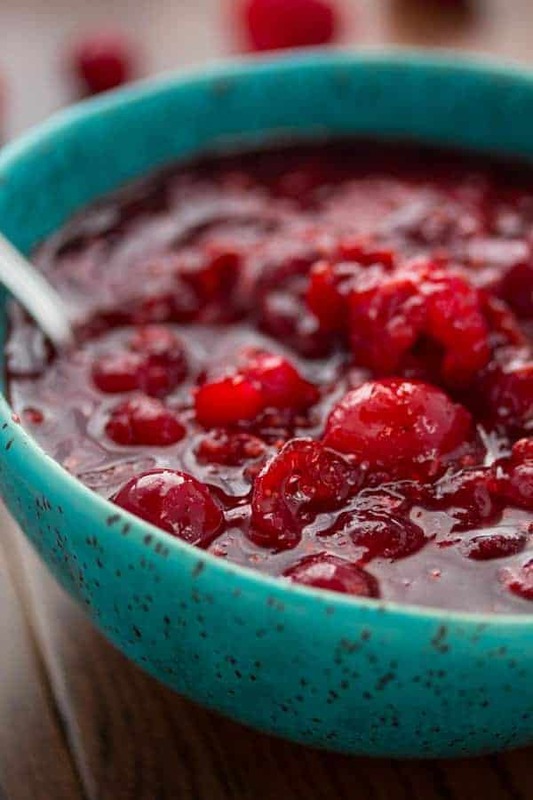 This cranberry sauce looks all kinds of amazing!! I will be for sure be making this for Canadian thanksgiving – it sounds delicious! I’m bringing Canadian thanksgiving to Belgium this year and introducing it to my in laws here!! 🙂 One of my fav. holidays for sure! I didn’t realize you were in Belgium! Good for you for throwing a Thanksgiving dinner, I lived in Australia for a few years and really missed my turkey dinner that time of year (even though it was their spring). Denise, I love your idea to add raspberries in the cranberry sauce. I’ve only made cranberry sauce once, and it was too tart for me. I’m pinning this, and I don’t care if it’s September. 🙂 Good luck with all of your plans! Karen, the strawberry-balsamic flavor combination is to die for, isn’t it? That’s where I got my inspiration for this recipe. Although the balsamic is pretty toned down, but could easily be increased for more balsamic flavors. I always find cranberry sauce too tart and never thought of adding anything to sweeten it up. 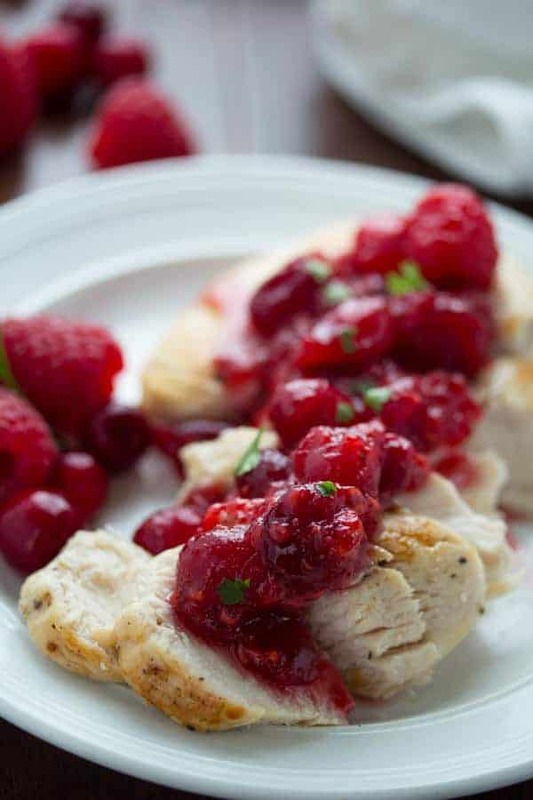 Love the additions of raspberries and balsamic vinegar – adding sweetness and richness to the tartness of the cranberries – great idea! Pinning for November. Thanks, Denise! I made a few versions of this and at first it was SO tart, almost bitter. I had to up the sugar to ‘mask’ the tartness a bit, so it is sweet, and a bit tart. Thanks, Geraldine! A friend of mine gave us a really nice bottle of the raspberry-balsamic vinegar, and it is so delicious! We put it on our salads and it has enough flavor that it doesn’t need anything else. Thanks, Gayle! I’m like you, I like a TON of cranberry sauce with my turkey. It’s all about that salty and sweet. Love that you added raspberry. Yum! Yay, another cranberry sauce addict 🙂 You’re right, that savory sweet is totally why I love cranberry sauce, because I don’t really care for it on it’s own. Thanks, Natalie! I like your cranberry rant! 🙂 Because I happen to agree! I have to admit, my cranberry sauce is always pretty plain and traditional. 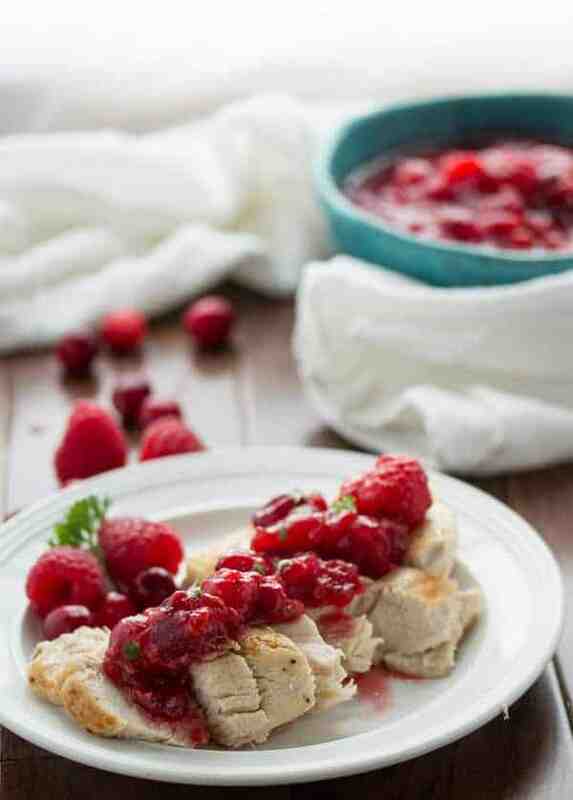 I love the raspberry and balsamic with this! And the idea of chipotle cranberry sauce is basically blowing my mind! What can I say…I love my cranberry sauce 😉 Maybe I should try to make a chipotle cranberry sauce…it does sound like a good flavor combo!